Recently, I began preparations for dandelion jelly. If you remember, I collected and processed petals a little bit at a time, freezing the petals between sessions. I had been processing the blooms by using scissors to cut off the ends and then removing any green bits leftover. Simply rip the flower in half, and pull out the petals. You WILL have orange hands afterward;). This went so much faster; I could’ve finished enough for the whole recipe all in one go. You need 4 cups unpacked dandelion petals. Once they are all ready to go; boil 3 cups of water and pour it over the petals. You can cover the container and leave the mixture to steep for anywhere from 1 hour to 24 hours to cool and draw out the flavor and color. I waited 3 hours. If you opt to leave it overnight, store it in the fridge once it cools completely. After steeping, I used a nylon coffee filter to strain out the petals, pressing out any remaining liquid by hand. You could use a fine mesh sieve, several layers of cheesecloth, or a clean pillowcase. I then strained the dandelion tea again using a paper coffee filter to clarify the liquid. As you can see in the pictures, it caught a lot of fine particulates that the first pass did not. I recommend using a sieve or nylon filter first because if you’ve ever used a paper coffee filter for straining pulp of any kind, you’ll know it can be painfully slow. Removing the bulk first just streamlined the process. Get all your canning supplies together and sterilized. This recipe makes 5 half pint jars , or 2.5 pint jars . I wanted 1/2 pint jars, but Walmart had ONE box of jars on the shelf, and it happened to be pints. :\ I suspect I was a tad early for mainstream canning season! Measure 3 cups of dandelion tea. If some of your liquid has evaporated, top it up with cool water. In a large pot, bring dandelion tea, lemon juice and pectin to a boil. Add sugar, and return to a boil, stirring to dissolve sugar. Remove from heat. Use a slotted spoon to remove any scum from the surface. 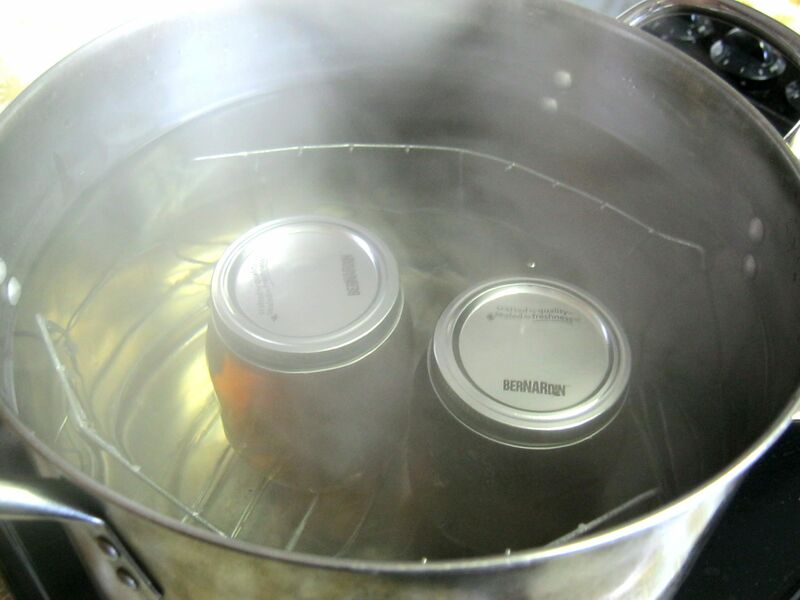 Remove sterilized jars from hot water one at a time and use a ladle or canning funnel to fill to within 1/4″ of brim. Use a wooden chopstick (not metal) to stir out any bubbles, and top up jar if necessary. Wipe rim of jar using a clean damp cloth. Top with lid and ring , turning ring to JUST finger tight. Return jar to rack in canning pot . Repeat to fill all jars. Process jars for 10 minutes at a full rolling boil in covered canning pot, starting timer once water begins boiling. Remove from heat and remove lid. Leave jars in the hot water for 10 minutes before using your jar lifter to remove to a counter where they will not be disturbed for 24 hours. Sit back and listen for that satisfying ‘ping!’ of your jars sealing. Once opened, jelly should keep in the fridge for about 4 weeks. I’m very happy with this jelly. It set up perfectly, and it tastes like an apple infused honey. There is a hint of a grassy scent – which I don’t notice in the flavor at all. 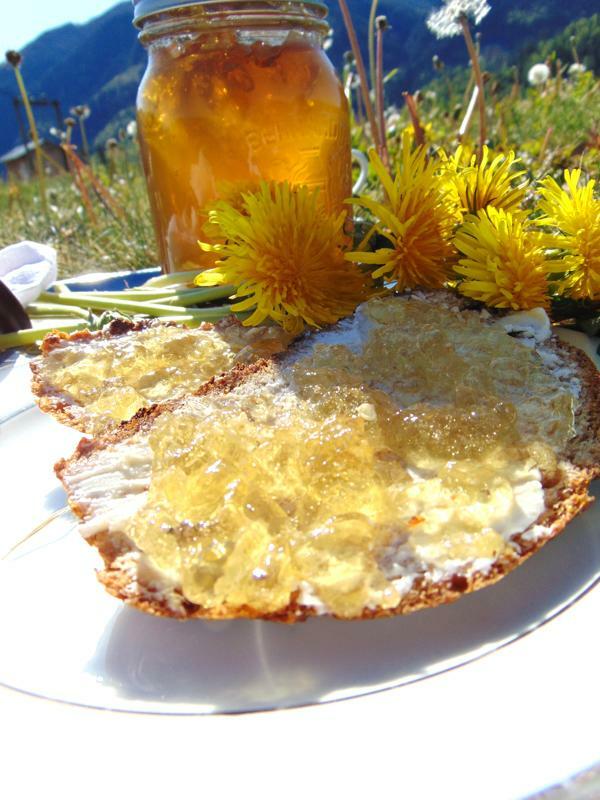 Will you try making Dandelion Jelly this year? I have been waiting on this post! Never heard of dandelion honey or jelly, but I have had the tea and wine before. You got me when you said “apples” that my favorite jelly so this has to be really good just on principle. Thanks so much for a great idea. I took down the recipe and hope this is at my table soon. Thanks for sharing! Now it’s here! Can’t wait to do this with my dandelion collection. Looks strangely promising. I have had dandelion tea before but not jelly. You have wonderful patience to make this. Looks yummy too. Thanks for sharing. I’m definitely trying this over the weekend! It looks and sounds awesome!! I didn’t even know that you could do this – thanks for the info! You’re welcome! :) You can make almost anything into a jelly, you just need to know how to get the right PH level for safety reasons and you could make jelly out of kool-aid!! What a unique flavor and sounds so delicious. You give such great tips and tricks!